Yorktown is one of my favorite historical places I have visited. I like how at the Victory Center Museum of the American Revolution, they actually take you through a day in a Yorktown Colonial Encampment in the Revolutionary time so you can know what it is like. I even got to see a real musket being fired! After going to the Yorktown Victory Center (above) we decided to go to the Yorktown Colonial National Historic Park. At the National Park there is a museum and they have an up to scale fake British warship. At the top of the ship, there is a children’s exhibit. There also is a map and it can light up the movement of the troops. 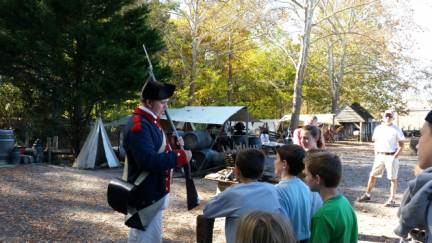 Historic Yorktown Village is a close drive from the museum. It has 18th century homes and one of them actually has dents and even a cannon ball in the side from the 1781 British siege. The Yorktown Battlefield is right outside the museum. It is where America won its freedom in October 19, 1781. They have earthworks and siege lines, which are things that tell you the position of the troops. They also have cannons everywhere that are super cool. It impressed me to be able to walk on the very same battlefield that the first Americans fought for our right for freedom. In 1607, 104 men arrived at Chesapeake Bay. They came on three ships Susan Constant, Godspeed, and Discovery. The trip was funded by the Virginia Company. Its main purposes were to set up a colony and find gold. Unfortunately no gold was ever found. A triangular fort was built by the original colonists. It was named Jamestown after King James. This became the first permanent English Settlement in North America. The first few years were rough in trying to find food, build houses, and befriend the Natives. An Indian girl named Pocahontas befriended the colonists. After their leader John Smith went back to England, the connections with the natives got worse. During the winter of 1609, Chief Powhatan and his warriors laid siege to the fort, trapping 300 settlers inside. Food was scarce, and lots of people died from starvation. When one girl died, other settlers resorted to cannibalism. Only 60 of the 300 survived. When we went there, we got to see an archeological dig site, along with a reconstructed house. The archeologists there have found around 3 million artifacts, but currently only about 1 million have been cataloged! Lots of these are in the museum, including: coins, animal bones, weapons, bottles, and lots more. They even found a loaded pistol in a well and a strange silver box in a grave! The island Jamestown Fort was built on is eroding quickly. Parts of the land that the original fort was built on are already underwater. Scientists predict that in about 50 years the whole island will be gone! As you are leaving the fort you can stop at the Glasshouse. This is a working glass factory built on the location where archeologists have found the original Fort Jamestown glass factory from the early 1600s. People make reproductions of bottles and glasswork found around the fort. It was fun to see the glass furnace and watch the artists shape glass. You can also see the ruins of the original glass factory from Jamestown Fort. Jamestown was a fun trip. 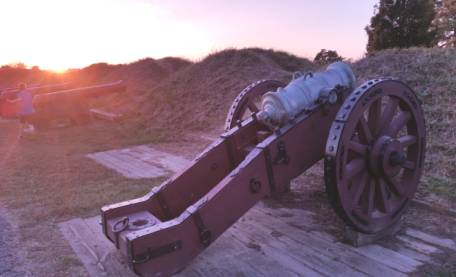 The National Park Service runs the Jamestown Fort, where the original fort was built. That was my favorite of the two. 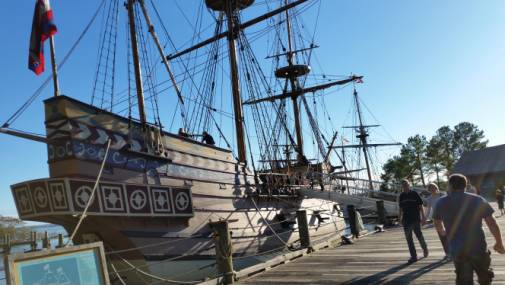 The Jamestown Settlement is a living history museum where the replica ships and Powhatan Indian village are. I loved seeing the artifacts and hearing the stories of the settlement. I recommend that you go to both next time you’re in the area. 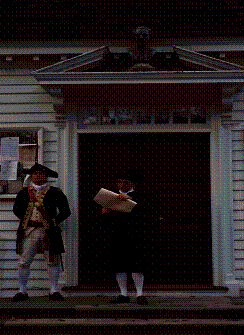 Colonial Williamsburg is another village from the Revolutionary time. Today, it has 88 original buildings and over 50 restored buildings. You have to buy a ticket to go in the historic buildings but we didn’t get the ticket and it was still fun walking around the buildings and streets. All the people working there are dressed up in costumes and acting their parts all day long. There are lots of reenactments you can see at different times of the day about what it would be like back during the Revolutionary Times. There are Ghost tours at night. You don’t need a ticket to see the reenactments. There is a little sheet you can get at the visitor center and you read about different buildings and match them up with pictures. Once you are finished you turn it in for a free pin. 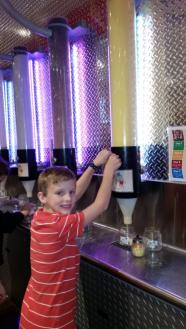 Yankee Candle Factory is a really cool kid-friendly candle shop. Inside it is built to look like a town square and shops on all sides. 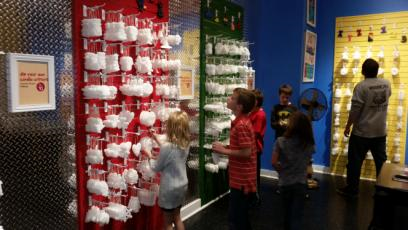 There is a Christmas room and it snows every 4 minutes, but it’s just soap bubbles. 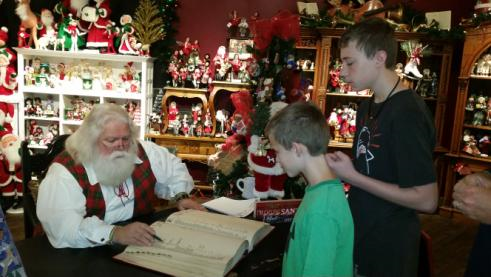 Santa Clause visits here sometimes and you can see if your in the naughty or nice book. I even found my name in there with 13 good marks. At the Candle Emporium, you can make your own jar candle, dip little wax figures in colored wax, or even dip your hand in wax and slide it out and color it to make a wax statue! I think the shop was pretty cool and it is one of the coolest stores I’ve been to. I made a wax statue of my fist, and got an airplane and painted is red white and blue. It was kind of expensive but worth it just because it is unique. Also the hand is very fragile, so you can’t blame me for not telling you!